Rain, rain go away; please send us a snowy day! Ok, that's pretty desperate, wanting snow to come and replace the rain! But I'm tellin' ya', I am sick of it! Oh, I know that big, beautiful sun is up there, still shining, I just need it to shine on me!! I can't think of much that I dislike more than a dreary, rainy day. Maybe Peas. And Cabbage. But not much else. Can you relate?? Well, I'm sort of bringing you some snow today with my Simply Stampin' Up! card. This is my semi-regular series of taking a published NON-SU! project and re-creating it with All SU! products. I got one of my Holiday card making magazines recently and this one practically jumped off the page at me! As always, mine's not exactly the same, but I kinda like it better. Maybe I'm biased, so that's what I have YOU for - to tell me the truth!! Ha! So, you ready to take it step by step? Layer 1 - I used a piece of Crumb Cake cardstock cut at 4 1/4" x 11" and scored it at 5 1/2" lengthwise with my Simply Scored Scoring Tool to make the fold. After folding, I set it aside. Layer 2 - I cut my piece of Night of Navy cardstock at 4" x 5 1/4"
Taking out my Delicate Doilies stamp set, I inked up the stamps with my Whisper White Craft Ink Pad and then covered them with White Embossing Powder, tapping off the excess in my Powder Pal tray. They were then embossed with my Heat Tool. 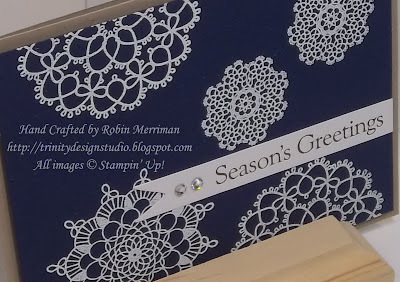 **TD Tip - Since I was embossing white onto dark cardstock, I needed to use my Embossing Buddy to de-static the cardstock before stamping. Well, I couldn't FIND my Embossing Buddy (guess I need to clean the studio) and I pulled out a used dryer sheet instead. Why not? Well, after rubbing it across the cardstock, it did the trick pretty well AND there was the added bonus of no white chalky residue on the cardstock. 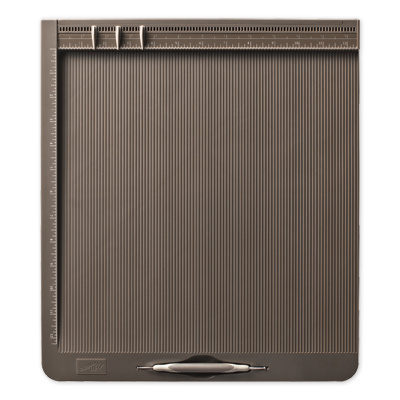 The Embossing Buddy can leave a bit of that on darker cardstock so you have to watch it. Never let it be said that a determined stamper can't find a solution! Once the embossing was done, I set the piece aside and worked on the greeting strip. I took a scrap of Whisper White cardstock and ran it through my Big Shot with the Petal Cone Die. There's a nifty little banner piece on one end of that die and it was perfect for my card! After cutting it out, I inked up my greeting from the Four the Holidays stamp set with Early Espresso Classic Ink and stamped it on the banner. I did use my Stamp-a-ma-Jig for placement. Made it easier since the stamp set is wood-mount only. I then added two Basic Rhinestone jewels to the greeting and adhered it to my card front with SNAIL. I trimmed off the right end to line up with the navy layer. That whole layer was popped up on 5 Stampin' Dimensionals and adhered to the folded Crumb Cake card front. Now if that's not easy, then I don't know what is! As always, you can purchase everything I've used to create my card today in my Online Stampin' Store! A special thanks to those of you who do place orders there! You have no idea what a blessing you are to me and my family. You can think of your orders as contributing to Emma's skating career! Because I can assure you, that's where most of it goes! HA! Have a wonderful day stampers! I hope you stay dry and get to stamp something fun!! Back tomorrow with another project to share! I do enjoy seeing your Simply Stampin up post. 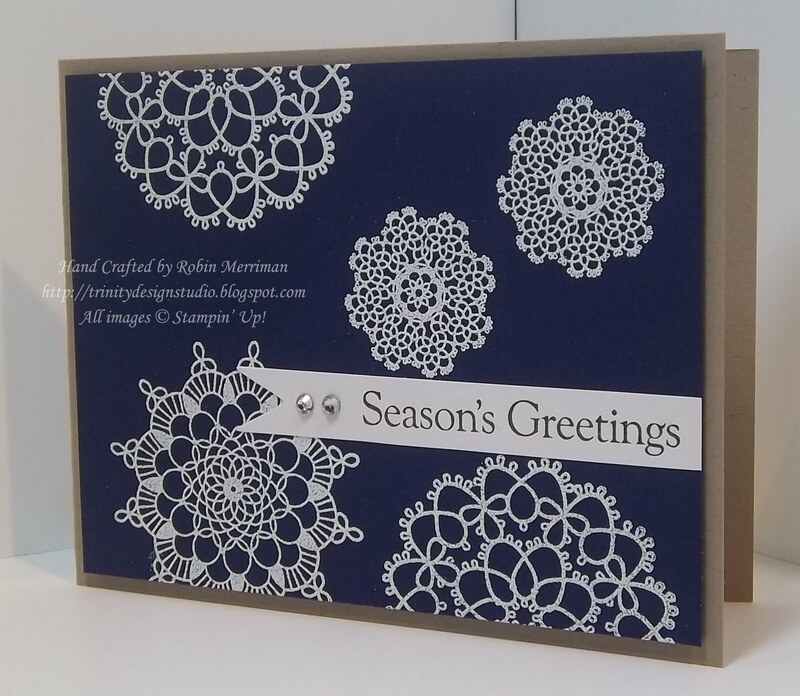 I used a card out of a magazine today for my inspiration using the Delicate Doilies set too. Thanks for your great posts! 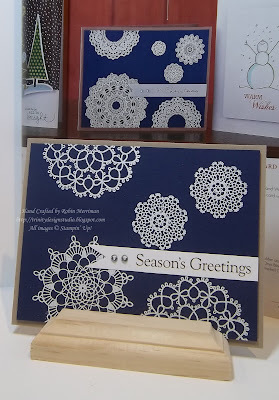 I love the card using the Delicate Doilies. Thanks for sharing your idea! This is stunning. 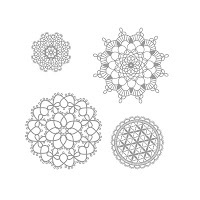 I like the idea of using the doilies for something other than doilies! And although i wouldn't exactly call something with embossing "easy," i do love the effect and would for sure do it... unless i was going to mass produce this card. Love these colours Robin. Makes a very delicate card!!!! I like this card!! It looks very good. It looks professional not homemade. I liked looking a the resto f your blog. I also like the name of your blog!! Just love this card. Inspired me to case it for my next Christmas Stamp-a-Stack class (with full credit to you and your blog of course!). Thanks so much for the inspiration. I like your card better than the original too! Repeating Kayleens words This will be a perfect card to case for my upcoming Stamp - a - Stack thanks for the inspiration!